The US housing crisis has been frequently reported as one major cause for the current financial turmoil. I was wondering whether indicators for the housing crisis can be found in Google’s Search Query Logs. To look into this, I compared the search volume for the following explicit intentional queries: “buy a house”, “rent a house”, “sell my house” and “find a house”. The results are interesting, yet hardly surprising. ” Buy a house” undergoes seasonal fluctuations, with peaks at the end/beginning of every year. Overall though, there seems to be a downward trend. At the same time, “sell my house” and “rent a house” are on the rise. “Find a house” is relatively stable, but slowly declining as well. Although subtle, the housing crisis can be identified in the data. Google Trends seems to provide some interesting data (such as the one above), yet I miss some features and several questions remain unanswered. I’d love to see a mashup with Google Maps, where I can not only plot the queries over time, but map them on different regions of the US. Questions that I would like to have answered include: 1) What is the absolute search volume of queries? Google does not give a way the absolute number of queries per of interest. 2) Does Google account for rising query volume? I assume that the total number of queries issued in 2004 is significantly lower than the total number of queries issued in 2007. So does a decline in, for example, the blue curve refer to an absolute decline in numbers, or to a relative decline that factors in overall query volume increase? 3) “Sell my house” does not have any data before 2005 – what does this mean exactly? 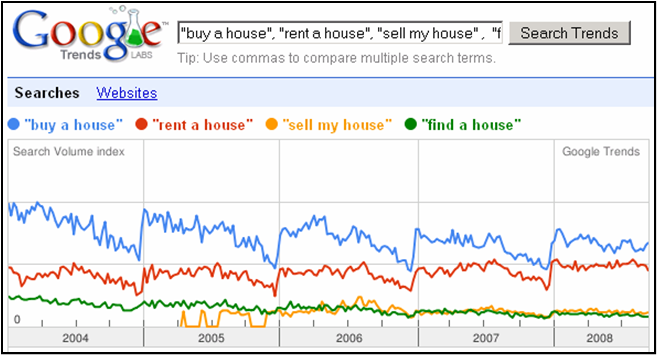 It seems odd that people on the web did not (or hardly) use the term “sell my house” before 2005 on Google. Yet, the kind of analysis provided by Google hints towards potential applications of taking an explicit goal-oriented stance on the web. Update (Oct 7 2008): It seems that Google Insights for Search covers many of the issues identified above. See the example here (you must be logged into your Google Account to see the numbers). My research group focuses on studying and analyzing the goals that users have on their web (also see my previous post on constructing goal graphs from 43things.com). To motivate some aspects of this topic in an upcoming talk, I have experimented with Yahoo Pipes. My intention was to visualize (some of) the goals users have on the web in an interactive and engaging way. Plus, I wanted to learn about Yahoo Pipes, which appears to be a powerful tool to quickly mash up information from different feeds/APIs. The outcome of this endeavor are two modest mash-up attempts using Yahoo Pipes, and the 43things.com API and RSS feeds. 43things Vision shows a configurable number of goals that were recently added to 43things.com (using this RSS feed) – and puts them on a map. 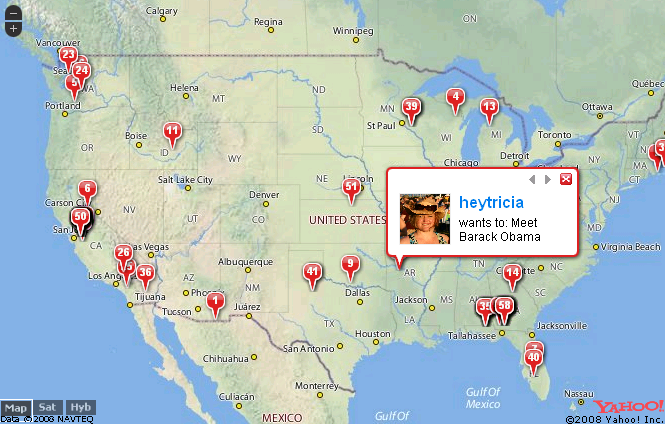 Because goals can only be related to a particular location via users, and newly added goals typically have few users, a major problem of this mashup is that a certain share of goals can not be mapped (that means a certain share of goals can not be related to a user who provides geo-information). This is where 43things GeoSearch comes in. 43things GeoSearch allows to query all goals on 43things.com, and ranks the result list according to goal popularity (number of users who share this goal). This produces much nicer results. (I might post a link to the talk where I used this demonstration at a later point.) The slides are available here.